After Donald Trump struggled through a foreign policy interview with conservative radio host Hugh Hewitt on Thursday, the 2016 Republican frontrunner accused Hewitt of asking "gotcha" questions and later criticized the host as a "third-rate radio announcer." But one of Trump's competitors for the 2016 nomination, former Hewlett-Packard CEO Carly Fiorina, faced a similar set of questions from Hewitt later on Thursday - and though she conceded she has some studying up to do, she didn't lash out at Hewitt about it. The host began by asking each candidate about General Qassem Soleimani, the head of the Iran Revolutionary Guard's Quds forces, and how the Iranian nuclear deal would affect Iran's militant proxies. Trump began his answer by discussing the Kurds, an ethnic group in the region. When Hewitt clarified that he said "Quds," Trump replied, "Oh, I thought you said Kurds." On General Soleimani, Trump asked Hewitt, "Is he the gentleman that was going back and forth with Russia and meeting with Putin? I read something....Not good for us. And what it shows is a total lack of respect, I mean, that the other countries would even be entertaining him, and they're entertaining him big league." Fiorina, by contrast, launched into a lucid argument that the nuclear deal would empower Iran's armed proxies in the region. "We know that the general of the Quds force has been a powerful tool of the Iranian regime to sow conflict," she explained. "The Iranian deal - which sadly, has just been approved by Congress - starts a massive flow of money, and that money is going to be used not only to build up an Iranian nuclear weapon - which they have been hell-bent on getting for thirty years - that money is also going to go to the Quds forces, going to go Hezbollah. It's going to go to all of Iran's proxies, which is why I've said to you on other occasions, Hugh, that we have to stop the money flow." Hewitt then asked each candidate whether they're familiar with the main players among the network of terrorist syndicates in the Middle East. "No, you know, I'll tell you honestly, I think by the time we get to office, they'll all be changed. They'll be all gone," Trump replied. "Those are like history questions. Do you know this one, do you know that one...as far as the individual players, of course I don't know them. I've never met them. I haven't been, you know, in a position to meet them." When Hewitt insisted he wasn't trying to play "gotcha" with Trump, the candidate didn't buy it. "Well, that is a gotcha question, though," he said. "I will be so good at the military, your head will spin. But obviously, I'm not meeting these people. I'm not seeing these people... it sounded like gotcha. You're asking me names that, I think it's somewhat ridiculous, but that's okay." Fiorina, facing a similar line of questioning, acknowledged she could bone up a bit on the issue. "I have to be very honest with you and say that sometimes I can get confused a bit between the name and group because they sound a bit alike sometimes, so I have to pause and think sometimes," she admitted. "But, I certainly know all those names both of the individual leaders and of the terrorist groups. I certainly understand where these terrorists are in play. I certainly understand that one of the most dangerous things that is going on right now is competition among these leaders and among their terrorist groups." 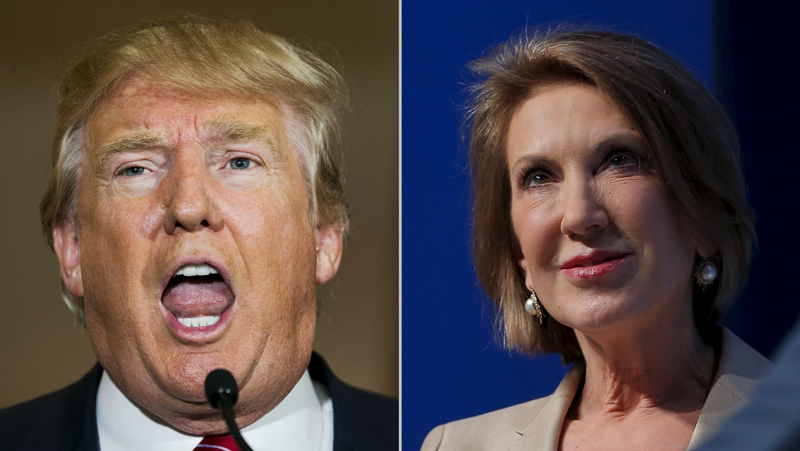 Fiorina closed the interview with Hewitt by defending the host from Trump's criticism. "I don't think they're 'gotcha questions' at all," she said. "The questions you're asking are at the heart of the threat that we face, that our ally, Israel, faces, that the world faces. It is critically important that America lead again in the world. It is critically important that we have a leader in the White House who understands the world and who's in it and how it works." During a Friday appearance on MSNBC's "Morning Joe," Trump, as he often does when he faces tough questions from the media, lashed out again at Hewitt. "You do have it right, and when you say Quds vs. Kurds, I thought he said Kurds," Trump said. "This is like a third rate radio announcer, that I did his show, it was gotcha gotcha, do I know this one and that one, he worked hard on that, I thought he said Kurds."